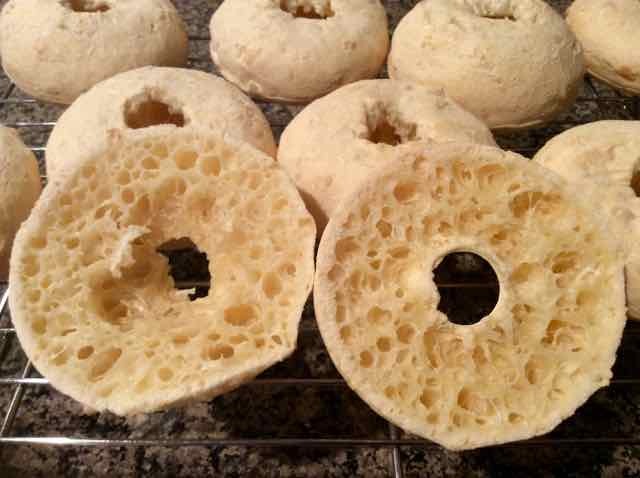 These bagels are light and delicious. Though not dense and chewy like the traditional bagel these are delightful and satisfying in their own way and very easy to make. 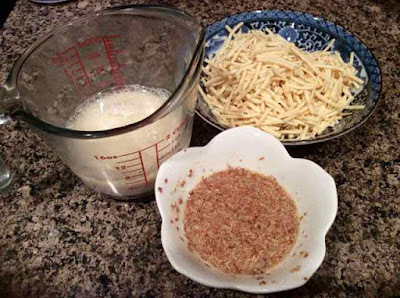 The method and ingredients are much like Brazilian Cheese Bread, but milk is added to the batter. The texture of the bagels are similar to, but not exactly like the Against the Grain brand sold in stores. 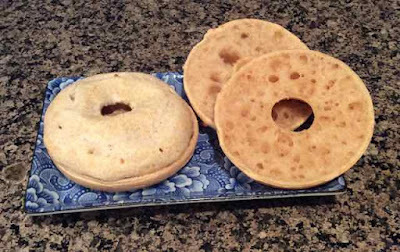 Using this recipe the outsides of the bagels stay smooth and do not flake off when cutting, toasting or eating them. I based this off of an Against the Grain copy cat recipe online. I adjusted the ingredients and simplified the method and directions. These bagels are easily made in one bowl of a stand mixer. You put all of the ingredients into the bowl in no particular order and mix for several minutes until smooth. I usually like to mix the dry ingredients together first to make sure that all the powders are evenly distributed, but I got distracted and added the baking powder and salt later and it all came out perfectly. One less step is just that much simpler. 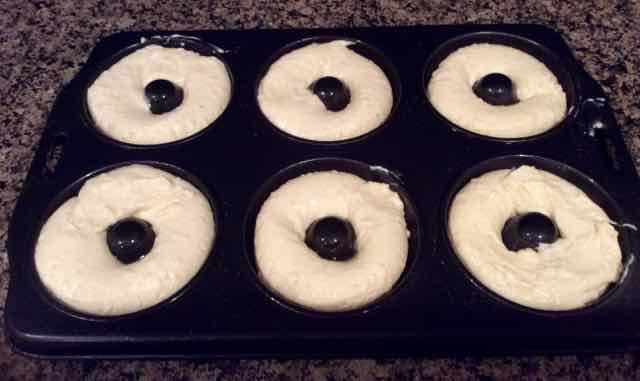 I put the finished batter into a large plastic baggie, snipped off a corner and piped the batter into oiled doughnut pans. With the vegan and teff versions the batter was very stiff and dough like so I just pressed pieces of that batter into the pans. I experimented with different ingredients. With teff flour they look like a whole grain bagel and, depending upon how much teff I used they had a little tang and more substance to them. I also made some with non dairy milk and non dairy cheese. The dairy free ones came out great. I cannot tell the difference from the dairy ones. I also tried some egg and dairy free vegan bagels. With these, I can tell the difference. I used flax eggs and the bagel was a bit gummy when warm and fresh. I cut them and froze them and when I toasted them later they were fine, no gumminess, just a little chewier than the others but very enjoyable. In some I added baking powder. Oddly enough the ones without the baking powder rose higher, but I preferred the texture of the ones with the baking powder. 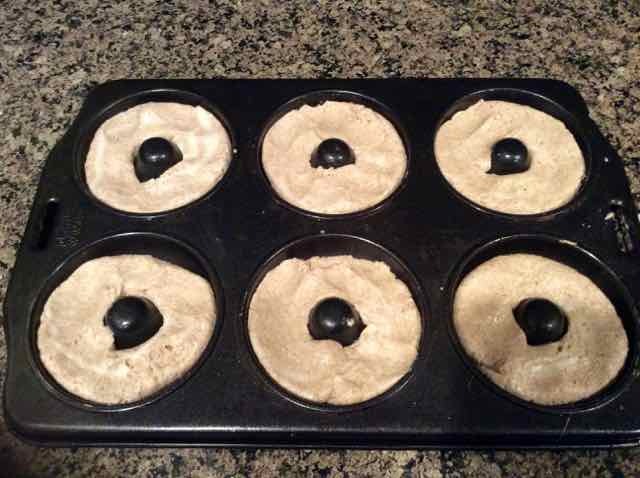 With the baking powder the insides were lighter and more even with less holes or spaces than without the powder. There was no difference in taste. I made a few batches in one morning, then I sliced each in half, put in plastic baggies and froze them. I just take one bagel out of the freezer and toast it before eating. These bagels are also so much more economical to make than buying similar ready made ones. To be more decadent and if you can have dairy you can use 3 Tbs. of melted butter instead of oil. For egg free or Vegan use 2 Tbs/15 gm Ground Flax seeds & 4 Tbs/60gm water - mix in a small bowl and allow to sit for 5-10 minutes until it thickens then add to the batter. I ran out of mozzarella and used half mozzarella and half havarti and it came out great. I think that you can experiment with a mix of cheeses including cheddar, parmesian etc. to get a taste you like best. For Dairy Free use non dairy milk - I used almond. 1) Preheat oven to 425℉. 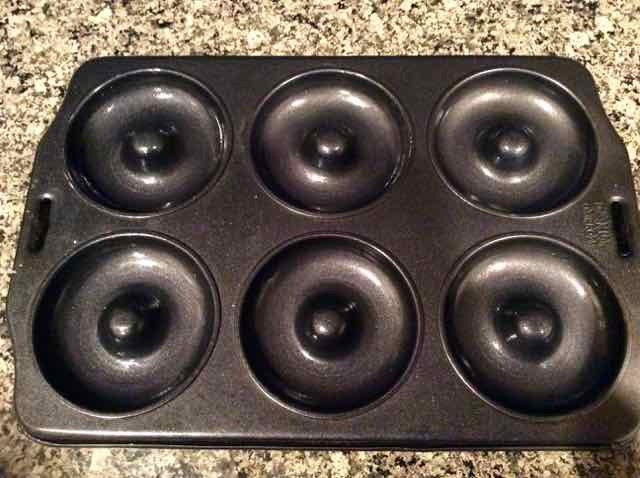 Prepare two doughnut pans by oiling them. Set aside. 2) Add all of the ingredients to the bowl of a stand mixer. Mix for about 3 minutes until the batter is fairly smooth with some small pieces of cheese still visible. All of the ingredients in the bowl of a stand mixer. Vegan ingredients. Almond milk, dairy free mozzarella shreds & flax eggs. 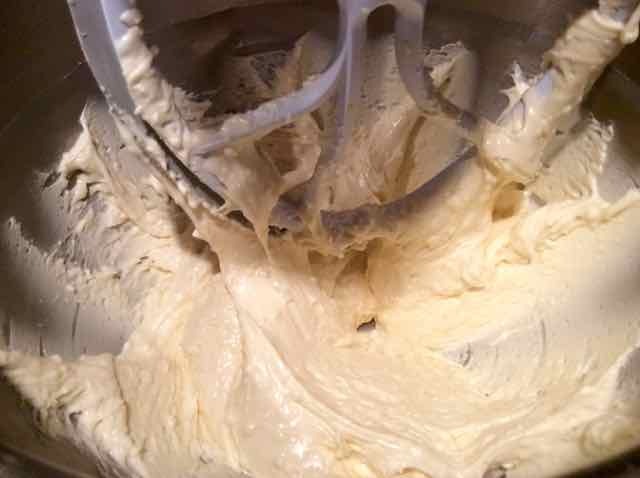 The dairy batter all mixed. The dairy free batter all mixed. It is thinner and runnier than the dairy batter. It is thicker than the other batters. Batter in a large (gallon sized) baggie with one corner snipped off. 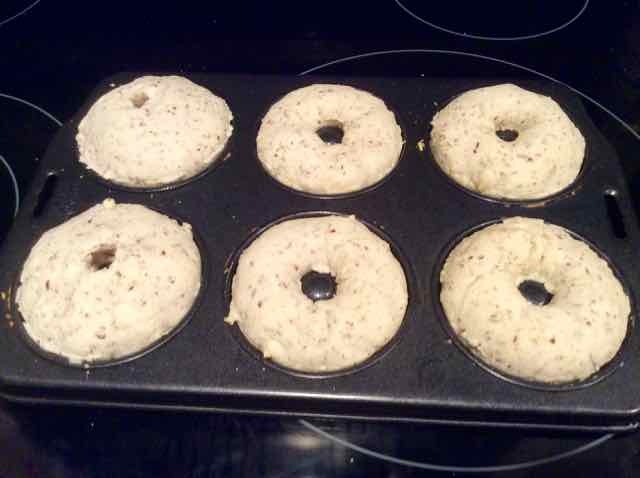 With the thicker vegan or teff batter I just put pieces of the 'dough into the doughnut pan. 4) Pipe some batter into the doughnut pans. 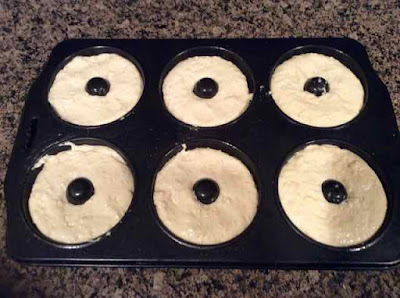 The batter can be tapped down with wet fingers to smooth out the areas where the batter ends meet. The batter should reach the top of the pan or slightly below. Dairy batter pipped into the pan. 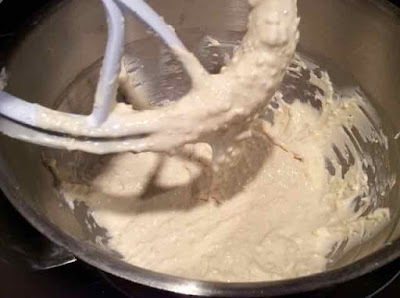 Dairy free batter pipped into the pan. Thicker dairy batter with teff batter pieces pressed into the pan. 5) Bake for 15-18 minutes or until slightly golden brown. 6) Allow to cool in pan for 5 minutes then remove to a rack to cool completely. 7) When completely cooled, slice with a serrated knife. 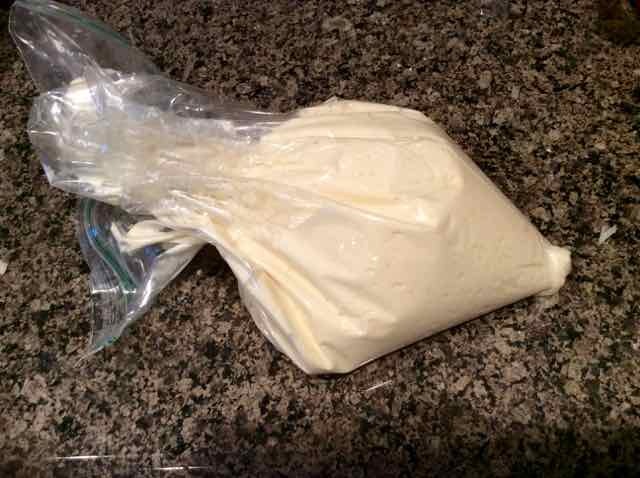 8) Store what is not used right away in a plastic bag and freeze for later use. Toast when ready to use. 9) I make several batches in one day, slice and freeze them. Yum! I made one batch and added 2 Tbs. to the batter. The bagels looked a bit darker like whole wheat ones but there was not much difference in flavor though the crust was crispier. I made another batch replacing ¼ cup/60gm of the tapioca flour with an equal amount of teff. These bagels looked much darker, had a tang to them and were a bit heartier. The crust was also crispier. I might add a Tbs. of honey or sugar to the next teff batch to offset the tang and sort of mimic honey whole wheat bagels. 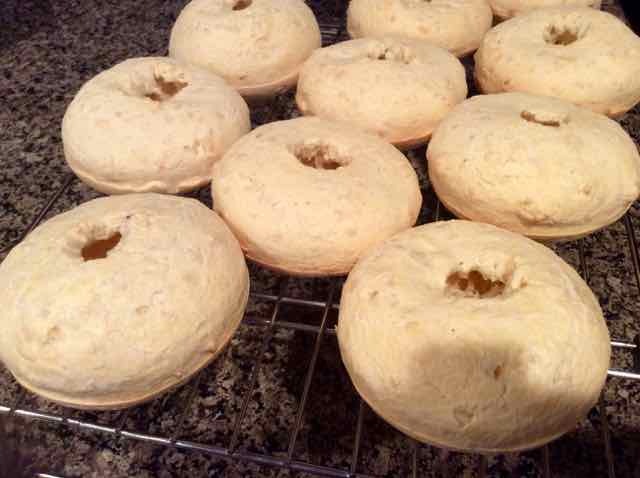 GLUTEN FREE NO YEAST BAGELS with DAIRY FREE INSTRUCTIONS Makes about 12 bagels or 8 Vegan bagels INGREDIENTS 2 ½ cups/300gm Tapioca Flour ¼ tsp. Himalayan Sea Salt 1 tsp. Baking Powder 3 Tbs. Oil - light tasting such as canola or sunflower To be more decadent and if you can have dairy you can use 3 Tbs. of melted butter instead of oil. 2 large Eggs For egg free or Vegan use 2 Tbs/15 gm Ground Flax seeds & 4 Tbs/60gm water - mix in a small bowl and allow to sit for 5-10 minutes until it thickens then add to the batter. 5 oz./1 cup packed Low moisture Mozzarella cheese - shredded I ran out of mozzarella and used half mozzarella and half havarti and it came out great. I think that you can experiment with a mix of cheeses including cheddar, parmesian etc. to get a taste you like best. For Dairy Free: use a dairy free cheese - I used Daiya mozzarella style shreds ⅔ cup/5 oz. Milk For Dairy Free use non dairy milk - I used almond. DIRECTIONS 1) Preheat oven to 425℉. Prepare two doughnut pans by oiling them. Set aside. 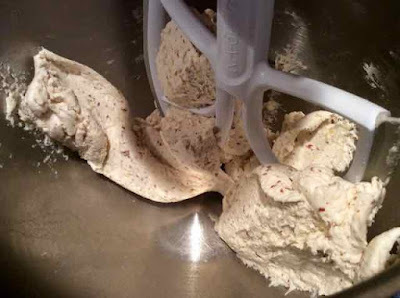 2) Add all of the ingredients to the bowl of a stand mixer. 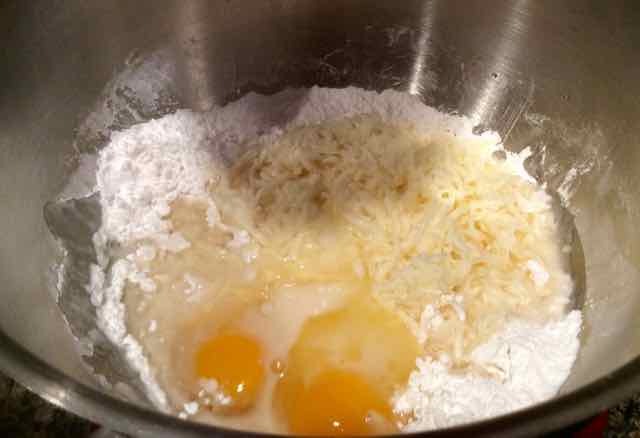 Mix for about 3 minutes until the batter is fairly smooth with some small pieces of cheese still visible. 3) Place the batter into a large baggie and snip off one corner leaving an opening about ¾-inch across. (With the vegan or if you replace ¼ cup of tapioca flour with teff flour the batter will be thick and it is easier to just press pieces of the thick batter into the pan and smooth out the tops.) 4) Pipe some batter into the doughnut pans. 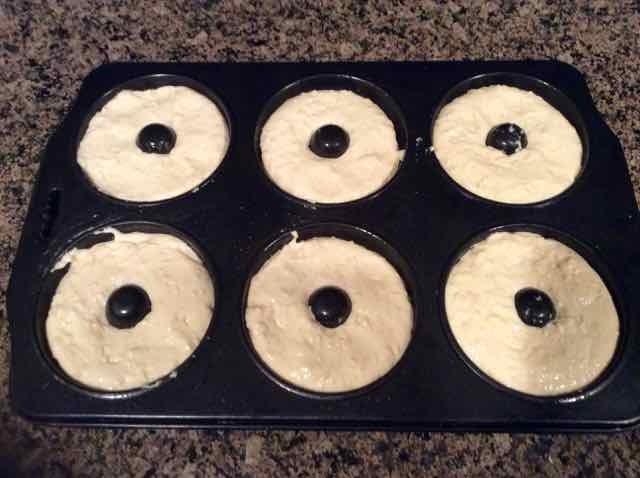 The batter can be tapped down with wet fingers to smooth out the areas where the batter ends meet. The batter should reach the top of the pan or slightly below. 5) Bake for 15-18 minutes or until slightly golden brown. 6) Allow to cool in pan for 5 minutes then remove to a rack to cool completely. 7) When completely cooled, slice with a serrated knife. 8) Store what is not used right away in a plastic bag and freeze for later use. Toast when ready to use. 9) I make several batches in one day, slice and freeze them. Yum! Notes on adding some Teff Flour: I made one batch and added 2 Tbs. to the batter. The bagels looked a bit darker like whole wheat ones but there was not much difference in flavor though the crust was crispier. I made another batch replacing ¼ cup/60gm of the tapioca flour with an equal amount of teff. These bagels looked much darker, had a tang to them and were a bit heartier. The crust was also crispier. I might add a Tbs. of honey or sugar to the next teff batch to offset the tang and sort of mimic honey whole wheat bagels.